In the winter, New Yorkers wear black. 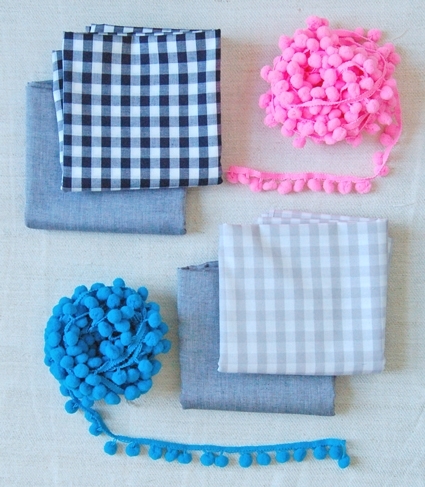 Sometimes you may see a spot of gray or even navy but rarely anything so happy as pink or turquoise or yellow. So by about now, I start to feel like I need some pigment in my life! 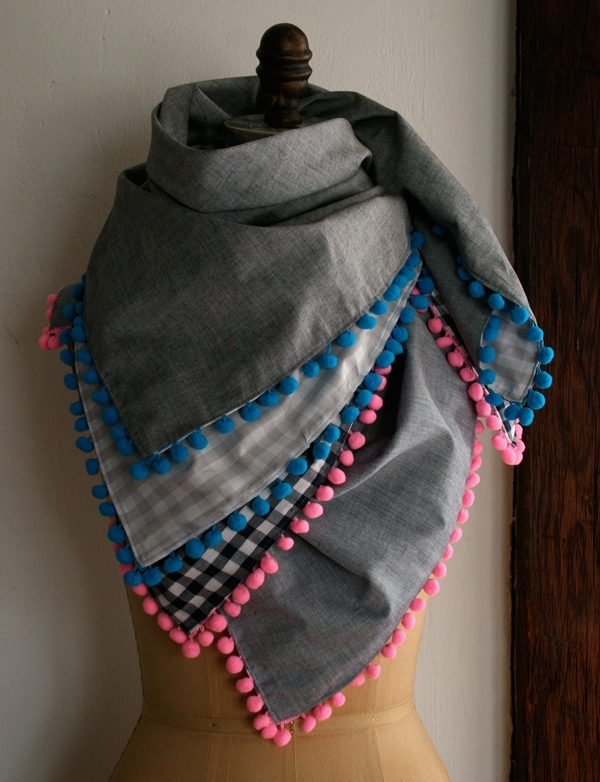 This Pom Pom Scarf scratches that color itch. It’s made out of silky soft 100% cotton so it’s totally comfy and will carry right over into my spring wardrobe. 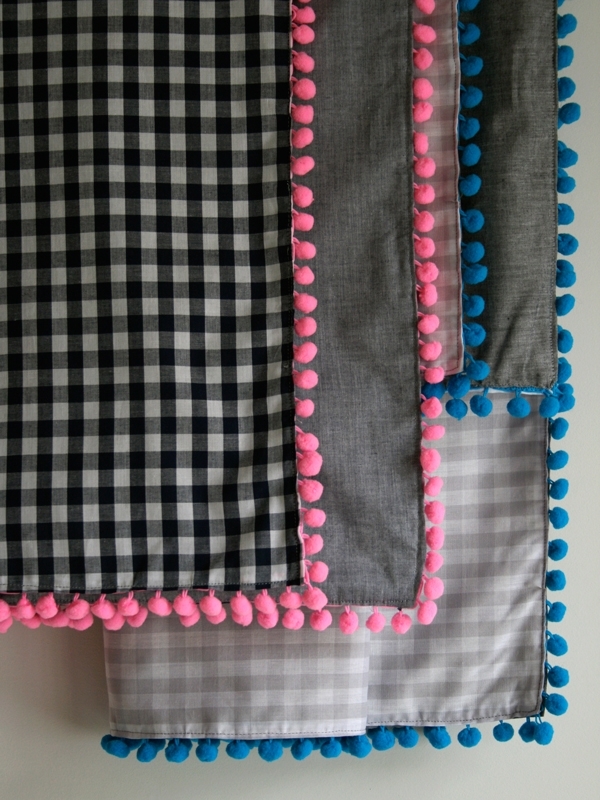 Kokka’s beautiful Fine Solids combine with their classic Gingham to set an elegant and unexpected stage for a playful little Pom Pom Trim. That burst of color next to a neutral background gives me just the kind of kick I’m looking for! 1-yard of Kokka Fine Solids. I used Black for the turquoise version and navy for the pink version. 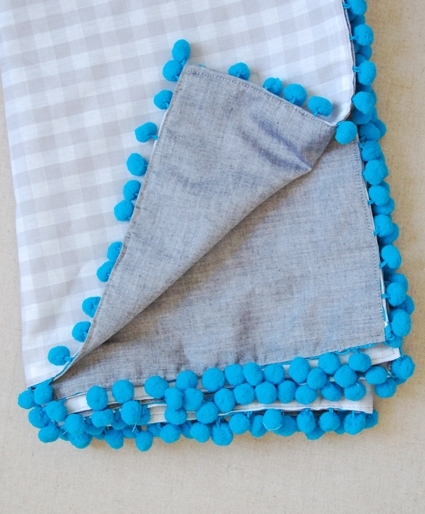 1-yard of Kokka Large Gingham. I used Grey for the turquoise version and Navy for the pink version. 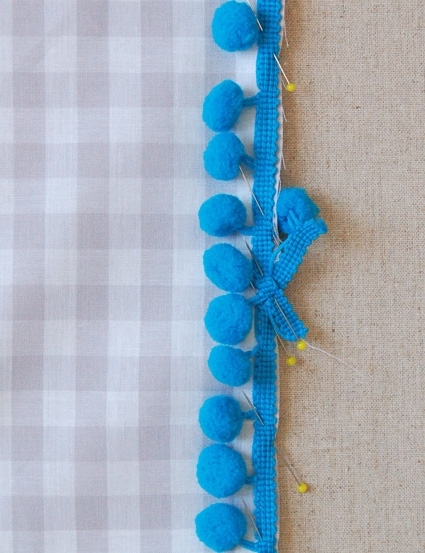 4 yards of Medium Pom Pom Trim. I used Dark Turquoise and Hot Pink. 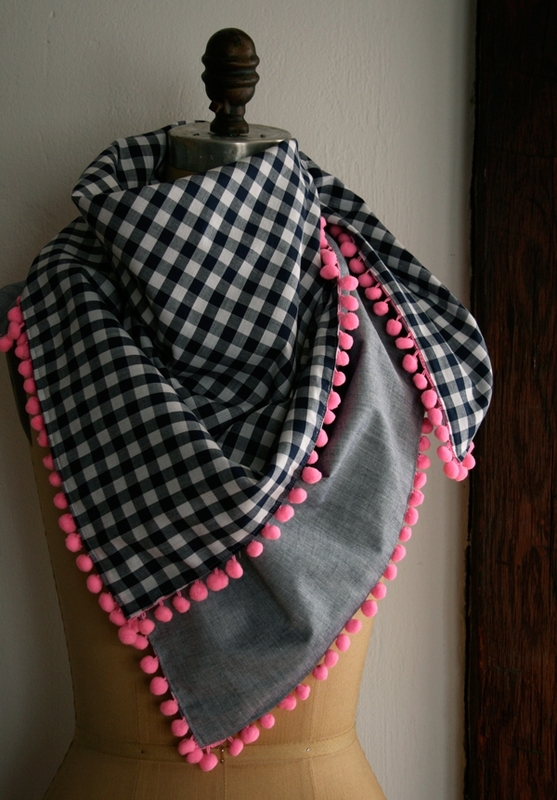 Cut the gingham fabric into a 35-inch square. 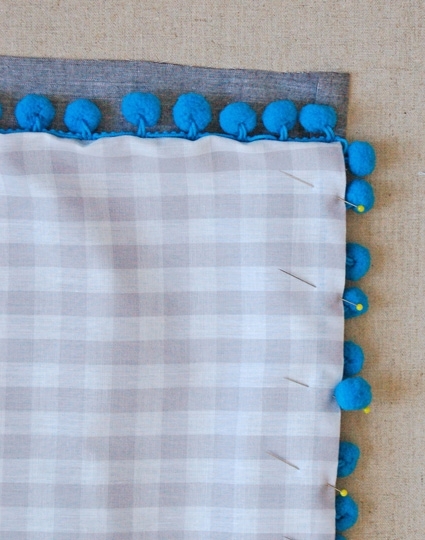 Beginning in the middle of one side, with the right side of the fabric facing up, pin the flat tape section of the pom pom trim along the the square’s raw edges so the pom poms are facing inward. When you get all the way around the four sides of the square overlap the end of the trim on top of the beginning. Cut the trim so it has 1-inch tails as shown above. 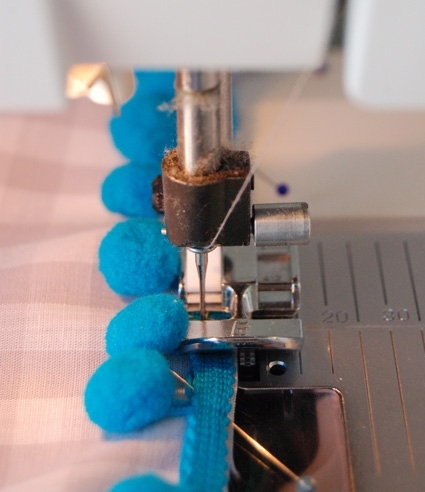 Attach the zipper foot to your machine using the left side of the foot. 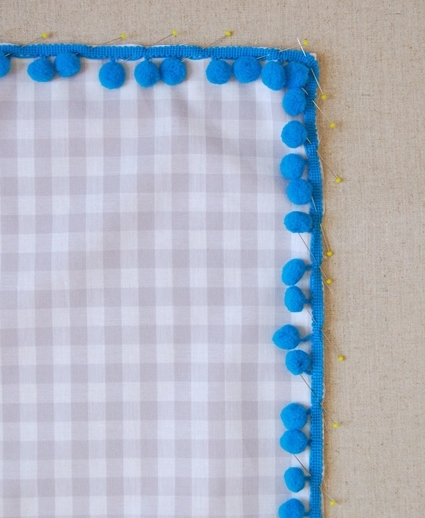 Sew through the middle of the tape side of the pom pom trim all the way around the square. Backstitch at the beginning and end of this seam. 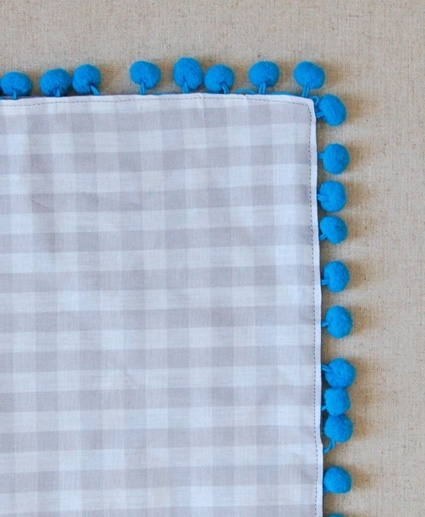 Make sure you have caught all of the trim and that you haven’t sewn into any of the pom poms. 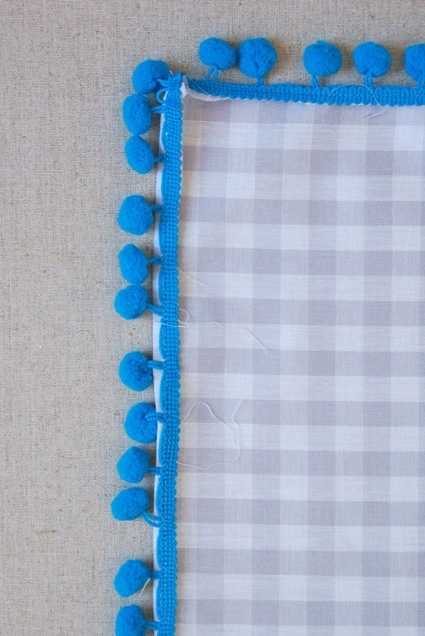 Also make sure that the corners are neatly sewn down. 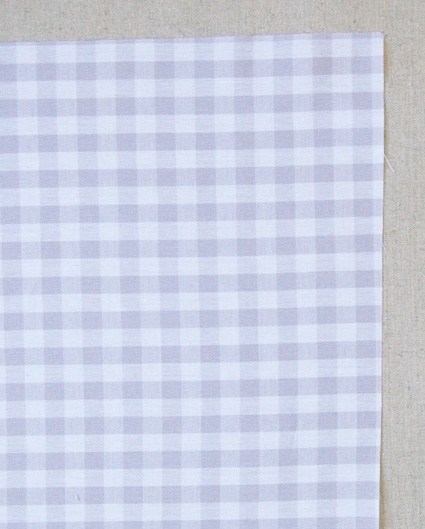 Flip the gingham to the wrong side. 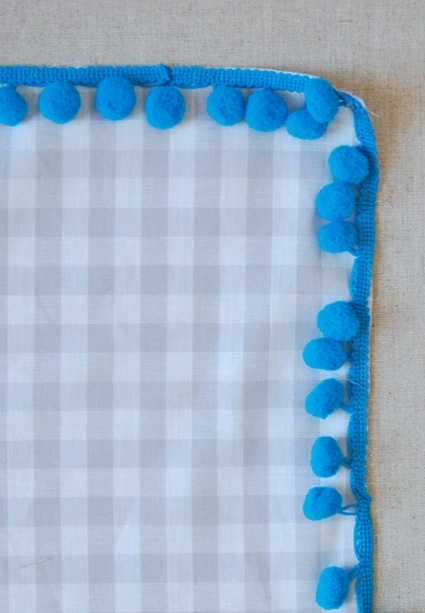 Press the four pom pom trimmed edges over 3/8-inch towards the wrong side. Make sure the pom poms are now facing out. 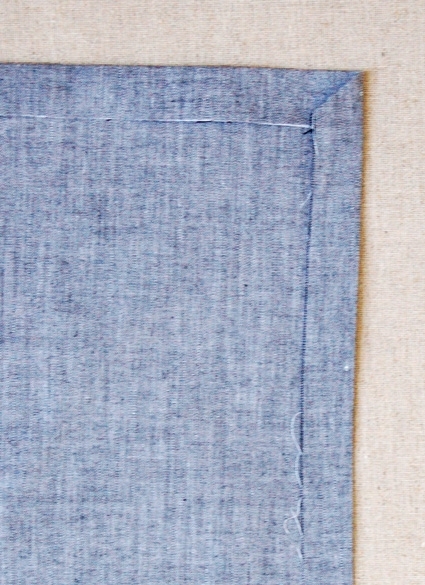 Cut the solid fabric into a 36-inch square. Press only the top and right edges over 3/8-inch towards the wrong side. Tuck this corner inside itself as shown above. 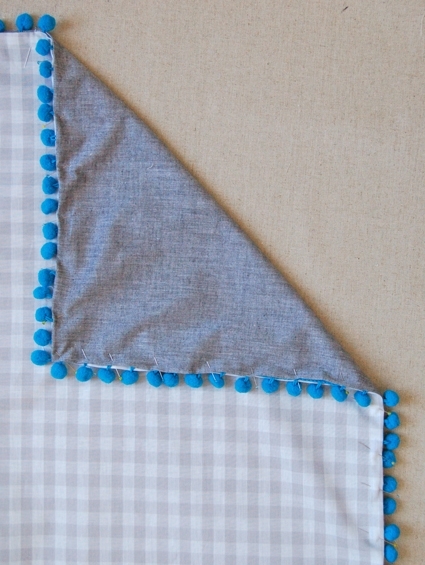 Starting at this pressed corner, lay the gingham piece on top of the solid piece, wrong sides together. 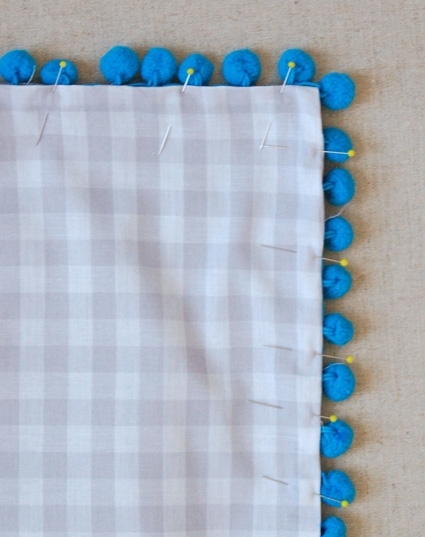 Pin along these two sides until you reach the un-folded sides of the solid fabric. Finger press the raw edge of the solid inward so that the fold matches up with the fold of the gingham piece as you pin the two sides together. Repeat this for the final un-pinned side. 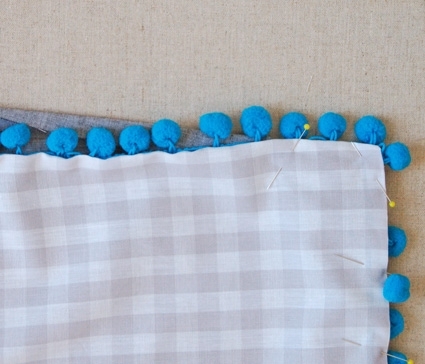 Make sure that both sides of the scarf meet up exactly at the edges and that the tape section of the pom pom trim is hidden. Pay special attention to the corners. If there are any raw edges sticking out fold them to the inside. Reattach the zipper foot using its right hand side. Edge stitch around all four sides of the scarf thus sewingh the two sides together and sandwiching the tape side of the pom pom trim inside. Backstitch at the beginning and end of this seam. Make sure that all of the sides are sewn shut. If there is a section where one of the sides isn’t sewn just go over that section as neatly as you can making sure to backstitch. Press the whole thing and you’re all done! Oh… I love it! Thank you so much! Thanks for the fun pattern.! 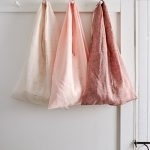 I can't wait to make one! thanks so much Molly! Love this. 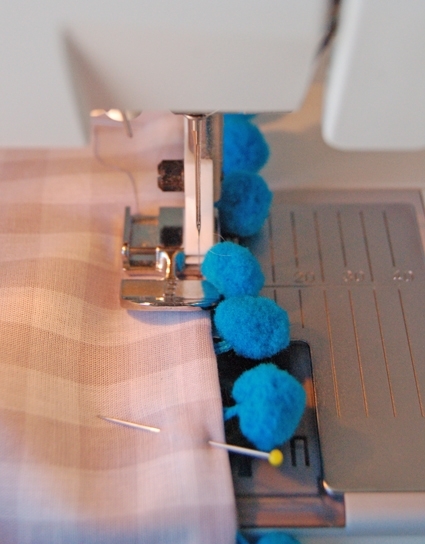 Just wanted to mention – for sewing on the pom poms: my machine + zipper foot = failure. But then I used my regular presser foot and it is working fine! So if anyone is having trouble with the zipper foot, there is salvation in the form of a standard presser foot. Can I ask why you only ironed two sides? 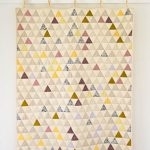 I'm looking at this tutorial as inspiration for a blanket, would that be different? You only iron the two sides of the second fabric with a 3/8-inch allowance because you need to adjust the other two sides to fit the first fabric exactly. This technique would probably work out fine for a larger blanket! Please let us know if you have any more questions! 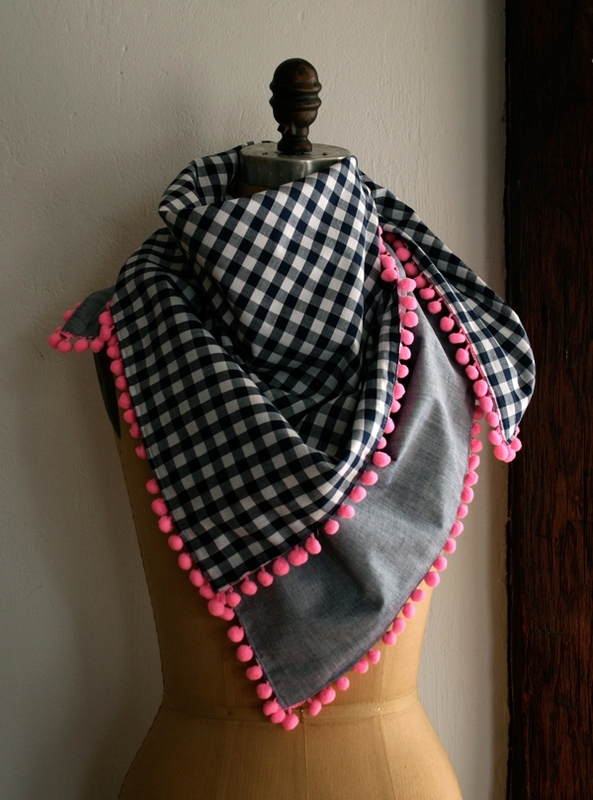 I just came upon your gorgeous pom pom scarf via pinterest. 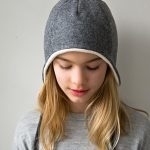 I have to say your tutorial is absolutely wonderful….being a bit of an ersatz sewer I really appreciate a simple, easy to understand tutorial on sewing projects!! 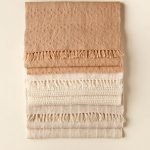 Can't wait to try making the scarf first and if that turns out I will venture to make a blanket. Love it!